It’s time to take a deep breath in and exhale out all of the stress that has been bottled up inside all winter long. On the same token, it’s an opportunity to open up the windows, and draw back the curtains to allow the fresh air, and sunshine to warm our hearts, renew our minds, heal and cleanse our bodies, as well as awaken our spirits with an exhilarating sense of well-being that gives us the energy to flourish. The arrival of spring-time is a reminder to make it a point to add specific tasks to our to do list. Some of those items may include things that should be done routinely, perhaps 2-3 times per year to stay on track. Just as we change the oil in our car every 3 months, schedule a physical once a year, or file our taxes, sticking to a routine is the key to getting more accomplished throughout our surroundings even if it means keeping a journal as a reminder to stay ahead of the game as the seasons change. The thought of cleaning in general can be very overwhelming, but it can be simplified when projects are divided and conquered one area or room at a time. For starters, walk around your living quarters with a tablet and a pen to create a list of the tasks that you desire to tackle according to priority. Next, designate a time to begin, as well as a specific time-frame to complete each project by coming up with a plan to work smarter instead of harder to visually renew, and freshen up your environment. Bedding Care: Wash comforters, bed skirts, bed, and throw pillows 2 or three times per year ~ pillow and mattress covers should be washed once a month. Bed sheets, shams, and pillow cases can be washed every other week. If you sweat at night or suffer from allergies or asthma, wash sheets and pillow cases once a week. Lastly, it would also make sense to deeply vacuum the mattress to remove the dust and dead skin that has been trapped over a period of time. Although it’s not visible to the naked eye, it’s there. Floor Care: Deep clean hardwood, tile, linoleum, and wipe down base boards using a soft damp cloth or sponge. Using a broom, sweep the carpet using swift strokes along the wall and in the corners to loosen up trapped dirt. Once that has been done, it’s time to thoroughly vacuum and shampoo. Sizable area rugs that don’t fit in the washing machine should be deep cleaned too. Window Care: Wash windows and wipe down window sills and blinds. Curtains and drapes should be washed or dry cleaned (follow care instructions). Wall Care: Wash walls, wipe down crown molding using a damp cloth, repair and paint all of the above if necessary. Using a long-handled duster, remove the cobwebs and dust bunnies that usually settle along the edge of ceiling walls and corners of the room. Door Care: Using a damp cloth, wipe down all doors and door knobs, including the ledge across the top of door, and door frame where dust settles. Miscellaneous Care: Sanitize toys, wipe down or dust lamps/shades, ceiling fans, vacuum dust bunnies from vents, and ceiling light fixtures. Remove dust/sanitize keyboards, and other technology related devices. Filters: Change furnace, air conditioner and microwave filters. Bathroom Care: Wash shower curtains, thoroughly scrub shower doors, including wall and floor tiles. Thoroughly clean the bathtub and mats, sink/counter top, cabinets, shelves, fixtures, and accessories. Inspect and replenish medicine cabinet contents for the warmer months ahead with items such as: sunscreen and a first aid kit. Kitchen Care: Using a soft damp cloth, wipe down cabinets inside/out, clean inside/outside and underneath the refrigerator and vacuum the dust from coils. Thoroughly clean the stove inside and out including the burner grates, and broiler. Wipe down counter tops, back splash, microwave, small appliances and accessories. General Home Care: Clean the exterior and the interior of the dishwasher, washing machine and the clothes dryer, including vacuuming to remove trapped dust particles inside, behind and underneath. Schedule to have the air conditioner serviced prior to the start of summer, and bleed the water tank. Schedule to have the roof, furnace, air ducts and chimney serviced late summer/fall once a year prior to the cold season. Furniture Care: Vacuum the exterior as well as underneath of the sofa, love seat and chair cushions to remove crumbs, coins, particles and other foreign objects. Wash throw pillows and covers according to the manufacture’s instructions. Dust hardwood surfaces and wipe down furniture made from other materials using a soft damp cloth or special cleaning aid. Outdoor Care: Take a walk around the outside of your home to inspect the condition of the exterior walls, siding, fixtures, garage, shed, lawn mower/trimmer, pool, deck, patio, chairs, and grill. 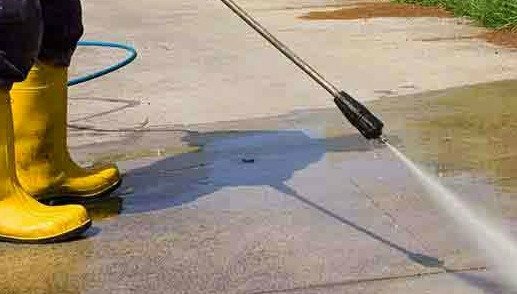 It’s a great time to pressure wash, wipe down and schedule to have repairs made if necessary. Fertilizing the grass, removing/treating weeds, and cleaning up debris left over from the winter months along with planting flowers can help to add curb appeal to your property, as well as increase its value. Just think ~ getting a little spring cleaning out-of-the-way now, makes it easier to enjoy the lazy days of summer, just around the corner. Disclosure: The tips listed in this post are solely of my own. Should you have any questions or tips that you would like to add, by all means, feel free to email them to: clutterfreelifestylesolutions@gmail.com I would really appreciate your feedback. As always, thank you so much for tuning in…. My spring cleaning consist of sanitizing and thoroughly cleaning one room a week until the entire house is sanitized. I clean the baseboards, ceilings, and walls. I try to do my regular household chores on Friday evenings or Saturday mornings, but lately I have been so busy. When my house is clean I am able to relax. I put my feet up and breathe in the fresh scents of pine or lemon. Wow, your daily and major cleaning plan of action is almost identical to mine. That’s amazing! Reblogged this on Clutter Free Lifestyle Solutions.